Yet Another SciFi Blog: Stargate DVDs Season 1 through 9 just $165 today only! Stargate DVDs Season 1 through 9 just $165 today only! This is for you Stargate fans! 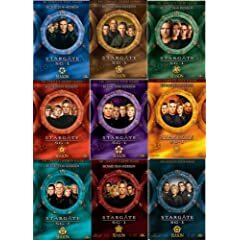 Amazon's daily deal of the day features seasons 1 through 9 of Stargate SG-1 as a single nine-season pack for $165 and free shipping. The price is only good for today. This has jumped into the Amazon Top 25 best DVD sellers. Bonus: watch online a trailer of Ang Lee's new movie "Lust, Caution".